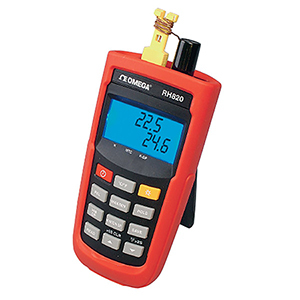 High performance humidity handheld meters available with USB or wireless connectivity. They offer a double display to show the temperature and humidity from built in sensors and can alternately display data from a separate Type K thermocouple connected via SMP type miniature connector. Save function allows storage of up to 256 readings (no time-stamp) to internal non-volatile memory. Software for USB and wireless versions is included to allow internal, external temperature, and RH data to be recorded by a PC. Interface cable is included with the USB version; receiver with the wireless version. 참고: Comes complete with 4 "AAA" batteries, Type K thermocouple, rubber boot and operator's manual. RS820W also comes with software and receiver, RH820U comes with software and USB cable.